In my office’s public-private partnerships trainings, we often open with an ice-breaker in which we challenge groups of participants to complete a puzzle as a team, without the box top as a guide. As the groups attempt to finish the puzzle, they eventually realize that they are missing one crucial puzzle piece—and have an extra piece that doesn’t fit. Entrepreneurial team members are able to figure out that one puzzle piece has been switched with another group’s puzzle, and it’s only by trading those pieces that each puzzle can be completed. The U.S. Department of State is just one of many government agencies that incorporates partnerships into its mission, in pursuit of ways to best address these challenges. That’s why, in 2009, the Secretary’s Office of Global Partnerships (S/GP) was created to serve as the entry point for collaboration between the Department, the public and private sectors, and civil society. The office serves as a matchmaker, connecting organizations with the relevant government office on initiatives from climate change to women’s empowerment, as well as connecting State Department colleagues with companies that are working on similar issues. S/GP also encourages the formation and management of partnerships both within the office and throughout the Department. 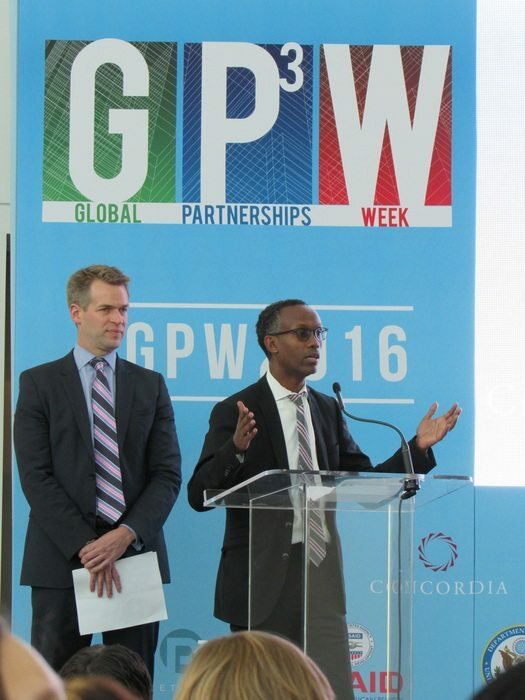 In support of that work, we convene the annual Global Partnerships Week (GPW), to recognize the critical role that public-private partnerships play in diplomacy and development work around the world. The week’s events welcome participation from the private sector, non-profits, multilateral organizations, and academia to highlight their own collaborative work with events and activities during the week. Fittingly, GPW is a partnership itself. Celebrated in 2016 from March 7 to 13, our office worked in collaboration with USAID’s Global Development Lab, Concordia, and PeaceTech Lab to create an overarching theme for the week, Leveraging Innovation in Partnerships, and plan the week’s activities. 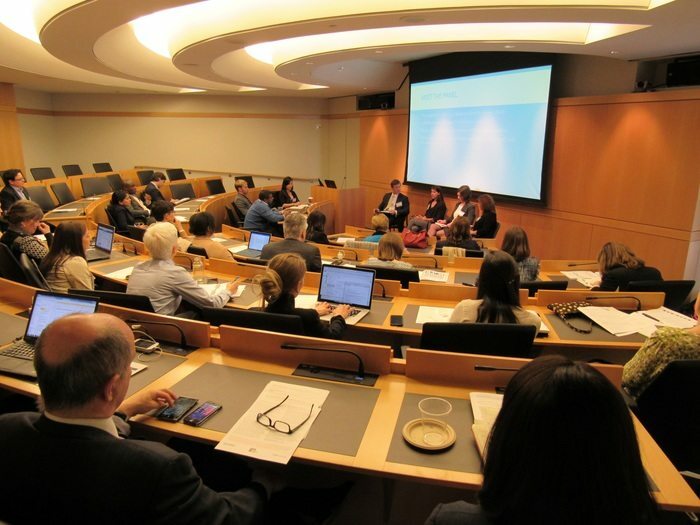 This year, the week kicked off with a full-day Global Partnerships Practitioners Forum at the U.S. Institute of Peace in Washington, D.C., with the theme of Innovators, Changemakers, and Disruptors: New Ideas in the Partnerships Landscape. The forum is unique in bringing together true partnership practitioners, who already embrace the shared value and importance of partnerships. The agenda encouraged practitioners to dive into the nitty-gritty of partnership, to explore how to cross institutional boundaries, and communicate most effectively with the tech sector. Breakout sessions offered colleagues the chance to learn about best practices in managing relationships, and how to use challenges and prizes, measure impact, and engage new partners. In practically every session, panelists stressed the importance of knowing your pitch and knowing your audience. Industry experts from Amazon, Paypal, LinkedIn, and Google chided the government for too-often reaching out to Silicon Valley with vague ideas without being able to demonstrate an understanding of the specific added value of the partner. Other large corporations are wary of being approached purely as a pocketbook—they are eager to find more shared value rather than sponsorship. Translating acronym-heavy government speak to a younger tech audience, and private sector bottom lines to the risk-averse public sector probably merits its own follow-on event. Overall, the message was clear: each sector needs to work harder to speak the same language as its partners to enable opportunities for concrete mutual benefit. Overall, the message was clear: each sector needs to work harder to speak the same language as its partners to enable opportunities for concrete mutual benefit. And the week didn’t stop there. GPW also included more than 30 self-organized events that took place around the world, from California and New York, to Ghana, Sierra Leone, Colombia, Honduras, and Germany. There were also a number of online events, from Twitter chats to Google Hangouts and webinars. Several events focused on the art of partnership, from a variety of perspectives. The Asian Development Bank hosted a briefing on the process of institutionalizing its partnership operations and the opportunities to catalyze private sector participation in infrastructure projects. An African Diaspora Tech Workshop at the new I/O Spaces in Silver Spring showcased the value of tech hubs in spurring entrepreneurship and convening stakeholders. The USAID mission in Honduras organized events in two cities recognizing successful partnerships with the private sector around sustainable development, and Endeva Institute led an impact venturing workshop on inclusive businesses in Munich. Our partners at Concordia worked with BNY Mellon and the YWCA on an event in New York to catalyze actions around gender parity and economic empowerment. International Women’s Day on March 8, with a Meridian International webinar on the success of the first-ever WiSci Girls STEAM Camp last summer in Rwanda, a PYXERA Global webcast on a Let Girls Learn initiative between IBM and Peace Corps in Ghana, a Calvert Foundation webinar on investment opportunities in clean energy companies that empower women, and a Twitter Chat with S/GP and our colleagues in the State Department’s Bureau of Oceans, Environment, and Science on sustainable fishing and the upcoming Fishackathon. Throughout the week, it was clear that the U.S. Government and our partners in the public and social sectors are leveraging collaboration to advance their work in innovative ways. Many are using competitions and challenges not only to engage wider audiences to solve problems and crowd-source solutions, but also as a public diplomacy tool. While tech is clearly a prevalent theme within innovation, not all innovation is necessarily drawn from new technologies. For instance, USAID is working with Digital Divide Data and the National Road Safety Trust to prevent road traffic deaths in Kenya with the simple introduction of stickers on public buses encouraging passengers to speak up against dangerous driving. Finally, the week highlighted how partnerships can offer new models for existing programs; for example, the 2015 WiSci Girls STEAM Camp was a new model of cultural exchange for the State Department, with tech companies like Microsoft and Intel providing in-kind curriculum development and teachers, Girl Up supplying the leadership development activities, and Meridian serving as the implementing partner. In his introductory remarks at the March 7 Practitioners Forum, Secretary Kerry reaffirmed the importance of partnerships in addressing and achieving Department priorities. “The time has long since passed,” he said, “when public-private partnerships were something rare and isolated. Today, they are major contributors to virtually every priority goal we have—from building peace to mitigating climate change to creating jobs to ensuring that advanced technology is used for the right purposes and with the right results.” Later in the week, S/GP released the third annual State of Global Partnerships Report, which highlights innovative partnerships from across the Department. “The time has long since passed, when public-private partnerships were something rare and isolated. Today, they are major contributors to virtually every priority goal we have,” said Secretary Kerry. Though Global Partnerships Week marks a high point of celebration of all that public-private partnerships have been able to achieve, our office will continue to highlight the power of partnerships to foster social inclusion and shared value year round. By bringing together diverse stakeholders, each with unique resources and approaches, we can continue to uncover innovative solutions to old problems, and creative opportunities to unearth new value. As partners, we become the missing piece in the puzzle, working together to further diplomacy and development around the world. A full GPW roundup is available at p3.co, including photos, videos, blogs, summaries, and other coverage. Stay tuned for the announcement of GPW 2017, which will focus on the importance of partnerships in achieving the Sustainable Development Goals.